So there you have it! Congratulations, Kate! And a big thanks to everyone who submitted their awesome suggestions... and thank you Melangell and Phil for judging and of course, thank you Farida for thinking up and organizing the contest! And thank you, Minh, for creating all these covers! You went way beyond the call, and I admire you for it. 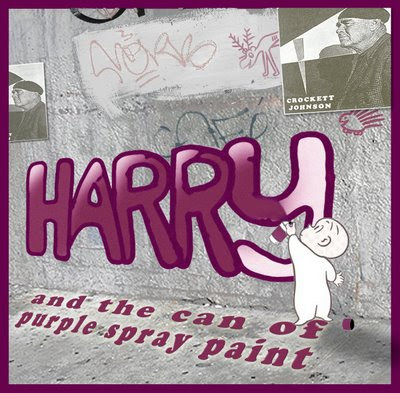 I just realized that Kate's submission was "the Can of Purple Spray Paint", not the "Purple Can of Spray Paint" like I have in the picture... that was not an editorial decision on my part, it was just a goof up! Sorry, Kate, I'll fix it when i get home. Tanita: thanks! I toyed with the idea of a more devious harry, but decided against it... looks like it was the right decision! This has been too much fun. Thanks to you both for dreaming this up. I've enjoyed it tremendously! There are so many creative (and twisted) people out there! Wow, it looks GREAT! I especially like the incorporation of the author on a poster on the wall. I did notice the migration of "purple"--I figured it was meant to match the cadence of the original title more closely. Of course, I was in uptight English teacher mode when I put "purple" just before spray paint! Anyway, thanks to you and Farida for a very fun contest and some fantastic new cover art. The Taking Tree is well done, as well, but I'm particularly partial to the kitten-and-meteor-of-death thing best. WHY do I keep writing these things at 6:00 in the morning? Please mentally correct my poorly edited comment, deleting "best" and ignoring or fixing the "well" repeat (author pet peeve)! Congratulations to Kate, Minh, and Farida! Minh, I finally got organized and wrote a post thanking the Academy, also linking all this to my site and showing off my butterfly herder. (You SURE you don't have time to do a book jacket of Owl Rabies or The Steadfast Tin Soldier: Judgment Day?) Anyway, you should go pro with this stuff! Kate, i'm glad you caught the poster of Crockett Johnson... did you also catch Harry's old friends, the moose and the porcupine? and thanks for entering and congrats on winning! I'm glad people had fun! p.s. if you have any tips on going pro, i'm all ears! tiredness, irritability, tingling, or bad temper. Regular check-ups for the first 12 weeks of treatment is a must.